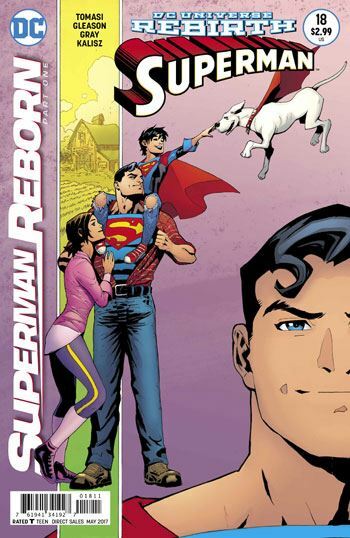 This issue of Superman has been heavily promoted as the beginning of the end for the Rebirth storyline. And yes, it is that. Although it’s very much a first chapter, with more mystery added, and no explanations or resolutions. The mysterious cloaked figure opens the story, the person who has been variously identified on the internet as Ozymandias, Batman, and lord knows who else. Although this could be a decoy, it appears that the Clark Kent who has been appearing in the Superman books, and who plays a significant role in this issue, is an escapee from the “prison” where cloaked man has been keeping Robin, Doomsday, and others. After that, the issue really begins to feel like a horror story. 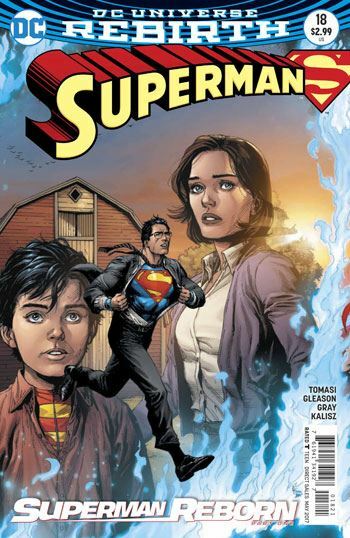 There is some really happy stuff with Lois and Clark and their son, Jon, as they celebrate their anniversary. The other Clark interrupts the celebration with a gift. It all seems harmless, if weird and creepy, and then things really get going. The remainder of the story is pure horror, a reality changing experience that is extremely well told and shown, as disturbing and frightening as it could be. There really isn’t a lot else to say about this issue. It’s a damn good first part of the story, but it is primarily a set up. Still, it did excite me for the resolution of Rebirth, and that was it’s mission, after all.